01:Vidoli Paolo X 05 Pax (Italy). 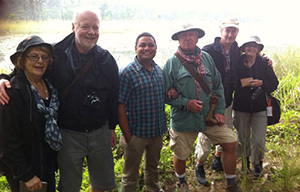 Cultural Tour Kathmandu, Pokhara and Chitwan National Park. 01 Jan 2014. Comments: Adventure Treks Nepal (Bhuwan Karki) organized a well rounded tour; with sightseein and Chitwan National Park. Everyone involved was friendly, helpful, fair and fun. Traveling with them is a great way to help the economy and keep these wonderful people employed. And it will be an amazing trip too! 02: Nardin Stefanta X 02 Pax (Italy). Annapurna Ghorepani Poonhill Trekking, 05 Jan 2014. Comments: Ed un grazie SPECIALE al nostro caro amico Bhuwan Karki, che ci ha accompagnato in questa meravigliosa avventura organizzato da ADVENTURE TREKS NEPAL , ricca di emozioni! Ci mancheranno pazzescamente le montagne, il gelo, le stufe, il cibo, le chiacchierate serali bagnate di Everest beer, ma soprattutto le partite a calcetto con le cacchine degli animali ! Speriamo di risolvere l'enigma della vacanza"chi e il bimbo"....in TIBET! Grazie infinitamente a te ed alla tua splendida famiglia! 03: Parrow Amanda X 01 Pax (Sweden). Kathmandu Pokhara, 14 Jan 2014. Comments: En fantastisk resa i Nepal! Tack för en fantastisk resa i Nepal. Vi har fatt delta nagra dagar i en byskola i Hemja, och upplevelsen av det "riktiga" Nepal och möten med människor där, bade barn och vuxna, är minnen för livet. Vi har utforskat Pokhara och Kathmandu med omnejder och inte minst gjort en hisnande vandring i Himalaya. Alla arrangemang fungerade perfekt och vi uppskattar särskilt den personliga servicen pa plats som pa ett effektivt och tryggs sätt tog hand om vara önskemal. Joachim, Amanda och Amelie pa vandring i Nepal. 04: Tulip Ehab Afifi X 03 Pax (Egypt). (Wildguanabana). Rafting Paragliding and Hikking, 24 Jan 2014. Comments: A big thankyou to Wildguanabana and team for being fantastic hosts for our week in Nepal! Everyone was also really helpful and accommodating to anything we needed over the days. They made us feel comfortable throughout our stay, we never felt rushed or pressured to do anything. They were professionals and showed us not only the best of the Nepali sights but also the best of their culture and people. 05: Maram X 04 Pax (Egypt). (Wildguanabana). Annapurna Ghorepani Poonhill Trekking, 14 March 2014. Comments: First of all - Gyan is the MAN! From start to finish, from pre-emails to post trek taxi cabs to the airport, Gyan took such amazing care of us! The level of service we gives to his clients is phenomenal and completely makes Adventure Treks the best choice! 06: Dan X 03 Pax (USA). Everest Base Camp Trekking, 23 March 2014. Comments: "Everest Base Camp Trek of a lifetime"
I have been to more than 70 countries on adventure tours including the Amazon Jungle, Galapagos Islands, Serengeti Safari, etc and this company is the BEST! The communication pre-trip was superb and they provided all of the essential information that a trekker needs to know to prepare for their Everest Base Camp trek. While on the trek we had amazing guides who were informative, motivated, friendly and the most dedicated leaders that I have met. Our guides were Bhuwan and Gyanendra and they were great. Gyanendra actually carried an ill trekker on his back for 2 days back to Lukla and then hurried back to catch up with our group (hiking 13 hours a day). At the end of the trip I not only had the experience of a lifetime but I felt like I had made new friends. Do not hesitate to book a trip with this company as I will definitely use them the next time that trek in Nepal. Dan & Team. 07: Elly X 22 Pax (USA & Canada). 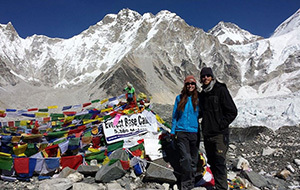 Comments: Adventure Treks Nepal ensured that everything went smoothly on our group's trek to Everest Base Camp. A lot can go wrong in 12 days on a mountain trek with 22 people, but you wouldn't have known it by the way our guides handled themselves. They were professional, fun, on-the-ball and I suspect they know how to read minds. They were there for us every step of the way on this once-in-a-lifetime trip and made it all amazing, even the tough uphill climbs. 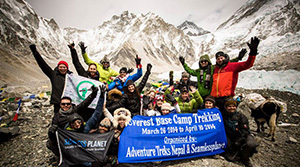 Seamless Planet Everest Base Camp Trek (Team 22 Pax). 08: Ashley X 02 Pax (Australia). Tsum Vally + Manaslu Trekking, 28 March 2014. My wife and I travelled to Nepal in April to do our first major trek. We chose to do the Manasalu and Tsum Valley circuits and after chatting to friends, we were recommended to go with Adventure Treks and were not disappointed. Gyan was always available for advice leading up to the trip and a smiling face on arrival. Sangam and Dev Raj were absolutely brilliant through the entire trek, happy to adapt the itinerary as we went along, always aware of what was happening and providing great guidance and support through the more challenging parts of the trek, excellent at spotting wildlife, always felt safe and in good hands, and most importantly always had a smile on their faces and a pleasure to be around. Would recommend you ask for them! With the snow coming a bit earlier, we finished a couple of days ahead of schedule and so asked Gyan to organise a side trip to Pokhara, by the time we reached the final stop everything was organised and car waiting. Having Adventure Treks made the trip exactly what we wanted, low stress, fun and an amazing adventure. Can't wait to go back. 09: Saini X 04 Pax (India). Kathmandu Cultural Tour, 04 April 2014. Comments: After we had decided on a trip to Nepal, we contacted Mr. Gyan over Vishal and arrange the sight seeing options there. He was very helpful and always prompt to reply on emails. He was also very accommodating and gave good advice on the feasibility and enjoyability of the tour. 10: Martin X 02 Pax (Usa). Annapurna Ghorepani Poonhill Trekking, 05 April 2014. 11: Susan X 02 Pax (Canada). Classic Annapurna Trekking, 06 April 2014. Comments: My husband and I travelled to Nepal in April of 2014 to trek around the Annapurna Circuit. From the beginning stages of planning the trip in Canada in the midst of winter, through to our flight home, it was a truly awesome experience. When planning other trips, we have benefitted from using the advice found in the Lonely Planet books. One of the companies that was recommended in Nepal was Adventure Treks Nepal, so we followed the advice and contacted them. From our first contact, through many phone conversations and email messages, we were so pleased with the company. We had asked for very specific things that we wanted such as a trek with just the two of us, an experienced and patient guide, and the ability to change our trip as we travelled. We received everything and more that we had asked for! Canada is a very beautiful, majestic country, and we have been fortunate to visit other amazing countries in the world; however, we are looking forward to our next trip to Nepal, as we have fallen in love with the country and the people. 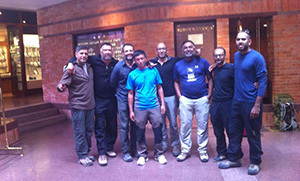 We will, without any question, plan our next trip through Adventure Trek Nepal, with Gyan and his staff. Hopefully, Shymbu will be our guide again as we explore a different part of Nepal ! 12: Marcel X 02 Pax (Sweitzerland). Annapurna Ghorepani Poonhill Trekking, 09 April 2014. 13: Eric X 01 Pax (Usa). High Passess with Island Peak, 10 April 2014. 14: Mats & Ann-Louise, Mikael & Lena (04 Pax)(Sweden). Ghorepani Poonhill Trekking with Rafting Chitwan National Park),12 April 2014. Comments: Nepal, a great country with a lot of color and kind people. 14 intense days , it was with River Rafting, trekking in a beautiful mountain landscape around Annapurna's snow-capped mountains surrounded by Rhododendron forests and cute little tea house along with our footpath, Jungle Safari in Chitwans National Park, both by Jeep and on elephant back. Got to see both Rhinos and a King Cobra, Awesome ! and many fine birds and crocodiles. Elephants was included as a natural part of the fleet on the village streets. We also got to experience the big city Khatmandu with its temples and palaces where it teemed with life day and night. Our guides and porters were fantastic in many ways, they took care of us and nothing was impossible. Thanks you for making this adventure possible for us and thanks to our guides who with his extensive expertise, genuine interest and vast knowledge helped make this becomes an unforgettable memory for life. Nepal, ett fantastiskt land med mycket färg och vänliga människor. 14 intensiva dagar blev det med bl.a. River Rafting, vandring i ett vackert bergslandskap runt Annapurnas snöklädda berg omgiven av Rododendron skogar och gulliga sma tehus längs med var vandringsled, Djungelsafari i Chitwans Nationalpark, bade med Jeep och pa elefant ryggen. Fick se bade Pansarnoshörningen och en Kungskobra, Häftigt !! samt manga fina faglar och Krokodiler mm. Vande sig sa smaningom vid att elefanten ingick som en naturlig del av fordonsparken pa by gatorna. Vi fick även uppleva storstaden Khatmandu med dess tempel och palats där det myllrade av liv dag som natt. Vara guider och bärare var fantastiska pa manga sätt, de tog hand om oss och ingenting var omöjligt. Tack Swed-Asia Travels för att ni gjort detta äventyr möjligt för oss och tack till vara guider som med sitt stora kunnande, genuina intresse och stora kunskaper bidragit till att detta blir ett oförglömligt minne för livet. Vi vill tacka för en väl planerad och arrangerad resa till Nepal. Vi har verkligen inget att klaga pa. Alla vara guider och bärare har varit sa himla bra och hjälpsamma. Bra hotell och bra mat. Maste ocksa säga det att det nepalesiska folket är nog de trevligaste vi har träffat. Sa vi kommer garanterat att göra reklam för Swed-Asia Travels till vara vänner. 15: Neil X 01 Pax (UK). Annapurna Base Camp Trekking, 12 April 2014. 16: Elaine X 02 Pax (UK). Annapurna Ghorepani Poonhill Trekking, 13 April 2014. 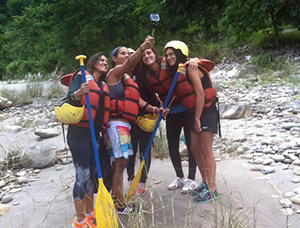 Comments: Adventure treks were really well organised and everything went according to schedule. A warm welcome at the airport, Gyan made sure hotel stays and transfers went smoothly. We had a very excellent guide Bhim, and porter for the trek. The trekking was fantastic. Views stunning and overall a once in a life experience. I kept having to pinch myself to remind me where I was, to drink it all in. Both my husband Mark and I are 50 years old. He's fit but I'm not exactly in peak fitness. I struggled on day three negotiating the hundreds of steps but Bhim's humour and encouragement got me there! Accommodation was simple, basic but friendly and we wouldn't have had it any other way. Loved the mountains the people and not seeing a motorised vehicle for four days! 17: Catherine Stanley X 03 Pax (Aus,UK and USA). Annapurna Base Camp Trekking, 13 April 2014. Comments: First of all - Gyan is the MAN! From start to finish, from pre-emails to post trek taxi cabs to the airport, Gyan took such amazing care of us! The level of service we gives to his clients is phenomenal and completely makes Adventure Treks the best choice! Two friends and I did the Annapurna Sanctuary Trek which, while not the most challenging certainly of the Himalayan adventures, it was wonderful and diverse and physically demanding in it's own right - and I would very highly recommend it to all climbers, especially if it is the only trek you ever do! Our guide (Ramesh - ask for him by name!) and porters were lovely, fun and extremely helpful and friendly. Ramesh's knowledge of the mountains and flexibility on our climbing schedules was brilliant - as was his walking radio! The recommended packing list and answers to our questions really made sure we were prepared. Be sure to ask as many questions as you like! Gyan is more than happy to answer - even the ones that seem silly! He also arranged for us a flight over Everest upon our return from the trek - again a total must do! I can't say enough good things about the Adventure Treks Nepal team - they really made our trip the experience of a lifetime! Thank you! 18: Hala Youssef X 01 Pax (Egypt). (Wildguanabana). Everest Base Camp Trekking, 13 April 2014. 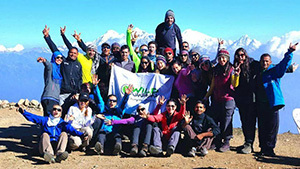 Comments: Great organised trek by Adventure Treks Nepal. E excellent service ! 19: Perdana X 04 Pax (Indonessia). Everest Base Camp Trekking, 14 April 2014. Namaste and a lot of greetings from Indonesia. I send you our testimonial, in English and in Indonesian language, to be included in your website. I would like to send you our condolences and deepest sympathy for all victims of the terrible tragedies in Annapurna regions -- I prayed that nothing is going wrong with the Adventure Treks Nepal and its crews because I know that you also arranging tours in that regions. 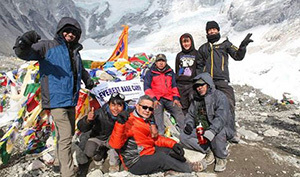 We are a pre-sixties age group of "four old foxes that jumped over the tropics," from rainy Indonesia to dry and colder Nepalese Khumbu, eager to straighten our leg muscles by trekking to Everest Base Camp in April 2014. It was made possible ..and enjoyable ..and memorable ..by Adventure Treks Nepal. Thanks to communicative Gyan B. Karki who provided all the information and arranged many things for us even before we got to Kathmandu. To Bhuwan who assisted and accompanied us all around. And of course a great many thanks to our friendly guide Khim Bahadur Rana and our special porters -- Ram and "Big Boss" -- who protectively watched over us with their smiles and guided us with their caring and safety consideration all along our two week treks. They have taken a large part of the travel burden from our shoulders. They have replaced it with pieces of Khumbu memories pasted into our souls. We shall never forget Nepal and we recommend proud Nepalese trekking company like Adventure Treks Nepal. Go with them. Kami ini kelompok jalan yang mendekati usia enam puluhan, rubah-rubah tua yang melompat dari wilayah tropis, dari Indonesia yang kerap hujan ke Khumbu Nepal yang kering dan lebih dingin cuacanya, yang masih bersemangat menguji otot kaki dengan nge-trek ke Everest Base Camp pada bulan April 2014. Semuanya dimungkinkan ..dan dibuat menyenangkan ..dan dibuat mengesankan ..oleh Adventure Treks Nepal. Terima kasih untuk Gyan B. Karki yang menyediakan semua informasi yang kami perlukan dan mengatur banyak hal bahkan sebelum kami tiba di Kathmandu. Terima kasih untuk Bhuwan yang menemani menyiapkan peralatan sebelum berangkat dan belanja oleh-oleh sebelum pulang. Dan tentu saja terima kasih sebesar-besarnya untuk petunjuk jalan kami yang ramah Khim Bahadur Rana berikut dua porter spesial -- Ram dan "Big Boss" -- yang selalu menjaga kami dengan senyum dan memperhatikan keamanan dan kenyamanan kami sepanjang dua minggu perjalanan. Merekalah yang menanggung sebagian besar beban perjalanan kami. Mereka gantikan beban itu dengan kenangan indah Khumbu yang terpatri dalam jiwa. Kami takkan bisa melupakan Nepal dan kami sarankan Anda untuk menggunakan jasa trekking company seperti Adventure Treks Nepal. Buatlah mereka bangga menjadi warga Nepal seperti kita bangga menjadi warga Indonesia. 20: Kugele X 03 Pax (Germany). Langtang Gosainkunda Trekking, 19 April 2014. 21: Amelie Parrow X 03 Pax (Sweden). Annapurna Jomsom Muktinat Trekking, 25 April 2014. 22: Durrand X 02 Pax (Usa). Everest Base Camp with Chitwan National Park, 13 May 2014. It was our first time in Nepal and our first time to do a trek. I would recommend Adventure Treks to anyone who wishes to have this experience. Our manager Mr.Gyan, our guide Shogum and our porter Dan were conscientious about our care and arrangements. Mr. Gyan met us at our hotel on day one and escorted us to rent our down jackets and sleeping bags. All arrangements were taken care of and we were supplied with trekking bags. We were introduced to our guide who picked us up in a taxi for the airport and flights to and from Lukla. Our guide looked after us every step of the way even bringing supper to our room after a strenuous hike. Our porter took our bags ahead each day but offered came back down from the destination to help further on the last stage of some hikes. 23: Late: Dan X 03 Pax (USA, Germany and Italy). Bhutan Cultural Tour, 13 May 2014. Comments: The perfect tour for those who don't want the hassle of having to research and plan the route to base camp. Quality of the tea houses vary, but generally they were much better than I expected and more than comfortable. Guides were friendly and alway made sure the pace was suitable for everyone. 24: Omar Samra X 26 Pax (Egypt...+). Remote Langtang Trekking, 15 May 2014. (Wildguanabana). Comments: What a life changing experience! The awesomeness of nature, beautiful scenery, never ending staircases 2 heaven, majestic peaks at sunrise, and my trekking buddies! This journey brought me inner calmness & serenity. 25: Ang and Doglas X 02 Pax (Malaysia+UK). Everest Base Camp Trekking , 09 Aug 2014. Comments: Everything was very well organized, the itinerary was great and included everything there is to see!! 26: Dr. Piyuse Das X 07 Pax (USA). Everest Base Camp Trekking , 29 Aug 2014. Comments: We used Adventure Trek tour company and Gyan took very good care of us. He was the first person I saw when I landed and last person who I saw when I departed - very personal service through and through, and they made it easy. We left and returned to NYC in 13 days (note, after we got to base camp, we helicoptered down instead of climbing down which saved us 3 days of climbing down), and we still had 2 days and nights of fun in Kathmandu to Tour around after our climb. All in.....flights, trekking, food hotel, permits, sightseeing was under Control highly recommand. 27: Patrick X 01 Pax (Canada). Comments: I just came back to Canada from the best trek ever. Thank you so much Adventure Treks Nepal. This trip was a success because of you guys. It started with a great welcome at the Katmandu airport and you took care of me until the last day. My guide Deb is an extraordinary person and he shared with me all essentials info about the Mountain, Sherpa life style, Nepalese culture etc .... This trip will stay in my memory for ever. I would like to come back one day with my son and show him this beautiful country and its great people. 28: Farida X 05 Pax (Egypt). Rafting Paragliding Hikking , 20 Sep 2014. Comments: I'm i Awe of this place! We had an amazing guide, he's a big reason why the trip was a lot of fun. Everything was very well organized, I can't wait for my next adventure! 29: David X 01 Pax (N. Irish). Everest Base Camp Trekking , 22 Sep 2014. Cho-la Pass, 22 September 2014. Having returned from an 18 day Cho-la Pass trek via Gokyo I can highly recommend Adventure Treks to anyone out there looking for a professional, organised, friendly company from which to arrange and book an amazing trip of a life time. As a single traveller, all the words on this page cannot express how well I was looked after and supported on my adventure by Gyan and his top class staff. He initiated contact on my arrival in Kathmandu, got me on a helicopter up to Lukla when all flights were cancelled due to bad weather during the first 4 days of my trip, he kept informed of my progress throughout the 18 day trek and even got me back to Kathmandu when my plane did not fly due to engine trouble. Gyan's professionalism is reflected in his staff, and in particular Dev, who had the unenviable task of being my guide and porter over the physically tough 18 days. Dev was not only superhuman in his porter skills, but caring about safety, health and wellbeing, was flexible to alter the itinerary and keen to share his vast knowledge about the beautiful mountains, wildlife and cultures that are so abundant in the Himalaya. The experience Adventure Treks has given me will stay with me for a lifetime. I am happy to recommend Adventure Treks as a professional, reliable company which consists of a group of fantastic individuals with whom I am proud to have shared an amazing journey and profound friendship, both of which I hope to reignite one day on my next visit to Nepal. 30: Chen Wei JIa X 02 Pax (Malaysia). Annapurna Base Camp Trekking , 23 Sep 2014. 31: David Moore and Lisa Jones X 02 Pax (Australia). Annapurna Base Camp Trekking , 27 Sep 2014. We have returned and have hit the road running. We are now back into the busy life of work and children. 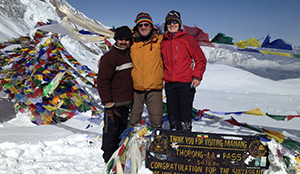 We just wanted to thank you for one of the most amazing experiences ever trekking the Annapurna Sanctuary. Nepal is a wonderful country and this unique experience is one we will tell everyone about. Right from meeting you we had a good feeling about this company. Being recommended by our friends and finding you in the Lonely Planet left us feeling reassured that it was the right thing to do going through a local company, which in turn kept the money in the country. Your team of Gyanendra and Khil were nothing short of excellent. Whether it was Gyanendra's professionalism, insight into the industry, skill level, or knowledge of the area, his approach was exceptional. We loved his sense of humour, friendliness and his down to earth approach to us. Gyanendra is truly a gifted professional. Khil was an absolute pleasure to be around. He was always happy, very perceptive as to our needs and so very helpful. Both went out of their way to make our trip the best that it could possibly be, ensuring we got the best of the accommodation, answering our many questions and checking on us continuously. They really are a great asset to your company. Without hesitation we would recommend your company to anyone looking to trek in Nepal and in particular, recommend the awesome team of Gyanendra and Khil to lead their way. We will make sure to put some good comments on trip advisor shortly and we look forward to keeping in touch and possibly embarking on another adventure with you all. 32: Sasha and Jan Gupta X 02 Pax (Canada). Annapurna Manang Trekking , 06 Oct 2014. 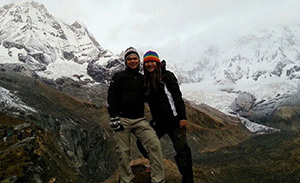 For our Honeymoon, my wife and I planned an adventure with Gyan Karki and Adventure Treks Nepal. This was after weeks of researching online and speaking with others. We were so happy with our selection. Gyan welcomed use at the airport and guided us for the first few days in Kathmandu. Also throughout the trek he stayed in regular contact, giving us a sense of safety while on our adventure. Our guide and porter, Sangam & Rup were both amazing to be with. 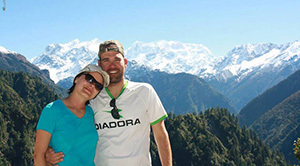 They had both been on the Annapurna Circuit over 25 times. They provided valuable advice and support on the trail. Also they gave us insights to the Nepali culture making the rip so much more enriching. My wife and I are already hopping to return back to Nepal. This time we are thinking of doing Annapurana Base Camp, or a trek to Mustang. 33: Kim X 01 Pax (Canada). Annapurna Manang Trekking , 07 Oct 2014. 34: Wayne X 01 Pax (Australia). Annapurna Base Camp Trekking , 19 Sep 2014. Comments: This adventure was super! Even at the coldest & toughest parts of the trip I couldn't help but crack a huge smile. It's totally worth it and I'll be back at another one of your amazing destinations! 35: Petra X 02 Pax (Canada). Annapurna Manang and Ghorepani Trekking , 06 Oct 2014. I would love to leave a testimonial, I hope it is not too late, and if so I'm hopeful that it can be used the next time you update. My mother and I had a wonderful adventure with you company. We thoroughly enjoyed our time in Nepal, and we owe the ease and comfort of how we traveled to Adventure Treks Nepal. The guide and driver for our cultural tours in Kathmandu were both kind and informative people who provided an excellent quality of service. We learned SO much about the culture of Nepal, things that we would never have even thought to ask. Bhuwan was an excellent guide. We were thankful that you could accommodate our small group of two, and that you made arrangements for our travel to and from Besisahar that was comfortable for us. The trek, of course, was the most enjoyable part of our trip. Lolit and Ram were a great team, and were wonderful company to have on the trek. They always treated us with kindness and were incredibly helpful and patient. We were pleased that Lolit had such a great amount of experience, photos and stories to share. He knew the Anapurna area well, and we felt like we had the best guide we could have! When the trip did not go as planned due to the weather, he was accommodating to the changes, and had a great idea on what would work best for what we still wanted to see with time we had left. At the end of our trip, when we had arrived in Pokhara to stay a few days, our guide showed us around Pokhara for several hours. We are so thankful to have had such an amazing trip! Thank you Adventure Treks Nepal! And truly a heartfelt thank you Gyan, for your services and help. I had a wonderful time! Hope everything is going well for you as well, hope the season is a good one for you. Maybe we will see you again in the future for another trek! Who knows! We know it would be a pleasure. 36: Eddy X 04 Pax (Malaysia). Ghorepani Poonhill Trekking , 15 Oct 2014. 37: Elise and Bianca X 02 Pax (Australia). Everest Renjola pass Trekking , 15 Oct 2014. Comments: I did the 14 day trek at the end of October 2014. From the moment we arrived in the KTM we were greeted by our hosts Adventure Treks Nepal. We had a few days to sightsee around the city with a local guide if we required it. The trek to Renjo La Pass was an amazing adventure, passing villages and winding up and over mountains on the climb to 5400m to the pass high above the beautiful Gokyo. We decided to use the local accommodation and stay in the tea houses, they were all really clean and the hosts were so friendly and happy to help in any way possible. Our guide was fun, friendly and knowledgeable and excited to practice his English with us. 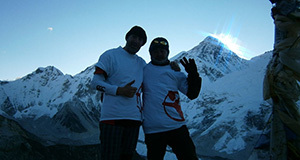 In the future I will return to Nepal and when I do I would absolutely use Adventure Treks Nepal again. I thank them for an amazing adventure. 38: Mark Day X 02 Pax (UK). Annapurna Base Camp Trekking , 16 Oct 2014. Comments: It couldn't have been better! 39: Edel X 02 Pax (Ireland). Ghorepani Ghandruk Trekking , 18 Oct 2014. Comments: Thank you for the great trip. We really enjoyed our time in the Annapurna foothills. The views were stunning and the experiences novel. Our guide (Gyanendra) was organised and friendly at all times. Accommodation was organised in advance so no worry regarding available rooms. The accommodation selected by him invariably had great food and no stomach upsets occurred. Our porter (kill) too was very helpful and walked with us for the trip rather than racing ahead. We made steady progress each day without feeling rushed. Thanks to both of them for a memorable experience. 40: Adrian X 02 Pax (Australia). Gokyo Valley Trekking , 24 Oct 2014. 41: David X 02 Pax (Spain). Ghorepani Ghandruk Trekking , 26 Oct 2014. 42: Giuseppina X 02 Pax (Italy). Mustang Trekking , 26 Oct 2014. 43: Kjell, Sune Erik X 04 Pax (Sweden). Kathmandu, Chitwan Pokhara Tour , 28 Oct 2014. 44: Nicolas, Natalie X 02 Pax (Luxemburge). Classic Annapurna Circuit Trekking , 31 Oct 2014. 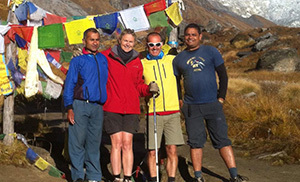 Comments: We travelled to Nepal in October-November 2014 to trek around the Annapurna Circuit. When planning our trip, we followed the advice in the Lonely Planet book and contacted Adventure Treks Nepal. We were very pleased with the company, especially with Gyan who helped us organizing this amazing trip. He arranged for a very competitive price a trek with just the two of us, a porter and an experienced and very friendly guide named Sangam. The highlight of this trek was the crossing of the famous Throng - La Pass (5,416m), very exhausting but breathtaking and unforgettable. We fell in love with the country and will, without a doubt plan a future trip through Adventure Trek Nepal. Especially these last weeks, our thought went to Nepal. We were shocked and deeply moved when we heard about the terrible earthquakes that devastate Nepal. Nepal is undoubtedly one of the most beautiful countries we have ever been to. The landscape and the people are incredible. Adventure Treks Nepal is a Nepalese tour operator that you can really trust. We highly recommend traveling with them. 45: Thomas, Low, Ramon and Erika X 04 Pax (Ausralia, Malaysia, Spain and Canada). Langtang Valley and Gosainkunda Trekking , 31 Oct 2014. Comments: As a couple that normally likes to travel independently, I was a little bit sceptical that going on an organised trek with guides and porters would enhance our experience. True, there is a sense of satisfaction in doing everything by yourself. But I think we can safely say we had a far more complete and stress-free experience by joining in on an Adventure Treks tour. Our guide Gaynendra was very informative and gave us insight into Nepali culture and customs, particularly those in the mountain. The trek was structured such that the impact of ascending to almost 5000 m was minimised. He also adjusted our trek along the way to suit our fitness levels such that we were able to see places not previously included in our itinerary. The porters Kil and Shankar, as well as being exceptionally strong, were also very supportive, beyond just carrying bags, helping us over treacherous sections, and even treating us with song and dance at the end of tiring days to boost morale. One of the most important aspects was Gaynendra's relationships with Tea Shop owners, to ensure we were given the best service, and his relationships with his porters. Gyan is very professional as manager of Adventure Treks, and really does look after clients throughout their time in Nepal, from the moment they arrive to departure. It also seems that he looks after his staff very well as well, which is of course very important. So overall we had an amazing time, Gyanendra and his team of porters were absolutely fantastic, and Gyan provides an excellent and complete service for his customers, so thank you Adventure Treks. We have absolutely no hesitation recommending Adventure Treks, and particularly Gyanendra, for anyone considering going hiking in the Himalayas. About Langtang Valley itself, it's certainly not as celebrated as the Everest and Annapurna treks, and while I can't comment first hand on these other two, it was certainly not over run with trekkers as I'm lead to believe these other two are. It has good mix of forested landscape, with our walk starting at 1,400 m in Syabru Besi, taking us along the river through beautiful rainforest, through villages, ascending above the treeline to the top of the valley, where giant ice-capped mountains loomed above us and yaks grazed around us. We then climbed to the peak above Kyonjin Gomba (4,825 m) to come face to face with Langtang mountain and glaciers showing obvious signs of retreat, before heading back to Dhunche via the beautiful Syabru Village. Our only regret is that we continue on the trek to Goseikunda Lake, where apparently Shiva and wife Parvati consummated their relationship in icy waters to conceive Ganesh (citation: our guide Gaynendra). Other options include crossing the Ganjala pass from Kyonjin Gomba (about 5000 m) and completing the circuit that way. So we are certainly very happy to have chosen to hike Langtang Valley. Please find below a little testimonial of our trip! My friends and I just returned from a 12-days awesome trekking trip along the Langtang Valley and Gosaikunda-Helembru region, perfectly organized and managed by Adventure Treks Nepal! When I first started organizing this trip I contacted dozens of trekking companies to make sure we would get the best deal, both in terms of cost and service. Gyan was the first one to reply … and with the best offer! He patiently replied all my inquisitive e-mails and tailor-made our itinerary based on our wishes and constraints. Once in Kathmandu, he picked us up at the airport, and made sure everything was fine before our trek started. The trekking in itself was a wonderful experience. We started from Syabru Besi, and up the Langtang Valley, which is very beautiful and still not too touristic for our taste. Afterwards we descended down to Syabru Village and crossed to Helambru over Gosaikunda lakes. Superb landscapes and amazing sunsets. But what made this trip really special was the excellent human team that took care of us during those 12 days. We were led by Gyanendra Karki, one of the finest trekking guides I have ever dealt with. He was extremely professional and thorough, handling in an effective matter all the logistics of our trip, from timetables to food and accommodation. He is also very knowledgeable, and throughout our hike he illustrated us on all sorts of aspects of the Nepalese culture, history and nature. We were also very well-tended by our porters Khil and Shanka, who looked after us in any possible way, and amused us with some Nepalese songs and dances (if you ever get to hike with them, please ask them to sing for you the song of the monkey and the donkey!). Bottom-line, based on our experience, Adventure Treks Nepal are very professional, reliable and also affordable, and I would recommend them to my friends without hesitation ! We would like to thank you for a wonderful experience and hope to have the chance to hike with you again ! 46: Jeff X 02 Pax (USA). Everest Base Camp Trekking , 30 Oct 2014. 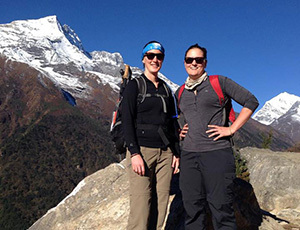 "We had a wonderful experience with Adventure Treks Nepal on their Everest Base Camp trek ! They took care of every detail starting in Kathmandu with airport pick up and our stay in a great hotel (it was the "budget" option but we loved it). Our trek guide and porter were excellent, they took very good care of us and were fun to trek with. The scenery on the way to base camp was absolutely breathtaking! Lodging along the way was basic but comfortable. Trip of a lifetime!! We highly recommend them. 47: Mishima Takashi and Mishima IE X 02 Pax (Japan). Everest Base Camp Trekking , 01 Nov 2014. 48: Ilje X 01 Pax (The Netherland). Chisapani Nagarkot Trekking , 01 Nov 2014. Comments: It was fantastic trip. 49: Neil X 01 Pax (UK). Langtang Heritage and Arun Valley Trekking , 04 Nov 2014. Comments: "I have used Adventure Treks Nepal over the past four years, for treks around Everest base camp and the Lantang Heritage trail. They provide a good service to clients, have a broad range of programmes at competitive prices, and importantly for me, they treat their employees well. I would highly recommend them." This year I have done Arun Vally and Tamang Heritage Trekking with same Experience. 50: Draperi X 02 Pax (UK). Kathmandu Valley Rim Trekking , 21 Nov 2014. 51: Peter X 03 Pax (UK). Sikkim Singelia Trekking , 21 Nov 2014. 52: Joshua X 02 Pax (Australia). Everest Base Camp Trekking , 06 Dec 2014. 53: Dave X 02 Pax (USA). Annapurna Base Camp Trekking , 06 Dec 2014. 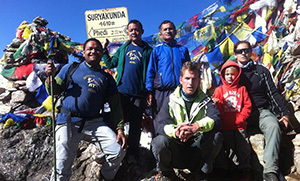 Comments: Adventure Treks Nepal organized my and my son's trip to the Annapurna Base Camp. The trip was fantastic. ATN took care of every detail, making the only tough part of our trek being the walk to the ABC. Our porter and guide were very helpful and really nice. I intend to have ATN organize one or two more treks for me in Nepal. 54: Hasreen X 02 Pax (Australia+Malaysia). Everest Base Camp Trekking , 10 Dec 2014. 55: Michelle Tan X 02 Pax (Singapore). Amadablam Base Camp Trekking , 11 Dec 2014. 56: Kennis X 01 Pax (Hongkong). Ghorepani Poonhill Trekking , 18 Dec 2014. 57: Paolo X 05 Pax (Italy). 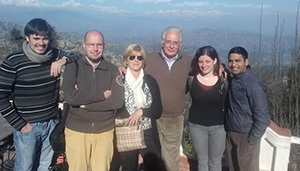 Cultural Tour Kathmandu & Pokhara and Chitwan National Park. 28 Dec 2014.